There are some very exciting things going on in my studio lately. Of course, as per usual I have about two dozen designs (or more ??) written down in my working notebook for 2014, but after the last four new design launches, I have been busy working with a client on a custom / reproduction. I should mention that I rarely do this kind of work anymore (reproductions) as they are VERY labor intensive and therefore time-consuming (researching ingredients, many times locating these ingredients is a task in itself; sniffing out and reverse engineering the design, creating samples and getting feedback….). The cost in time alone can become exorbitant. In the past, I used to take quite a lot of commissions to do this sort of thing just for the opportunity to see and feel what other perfumers had done, what choices they were making in the constructions, what materials produce what results, etc. It goes back to the ‘copy a masterwork to learn’ method that I came out with from art school. But those were the days when I had a fair amount more time to devote to that kind of learning and taking on those clients who just could not let go of their (discontinued) beloved. I recently made an exception. Not merely because my client is so lovely and I wanted to work with her, nor because she is battling cancer and this scent is her dream, but because the perfume she wanted to have made is a true gem. I wanted to work on it purely from an artistic standpoint. 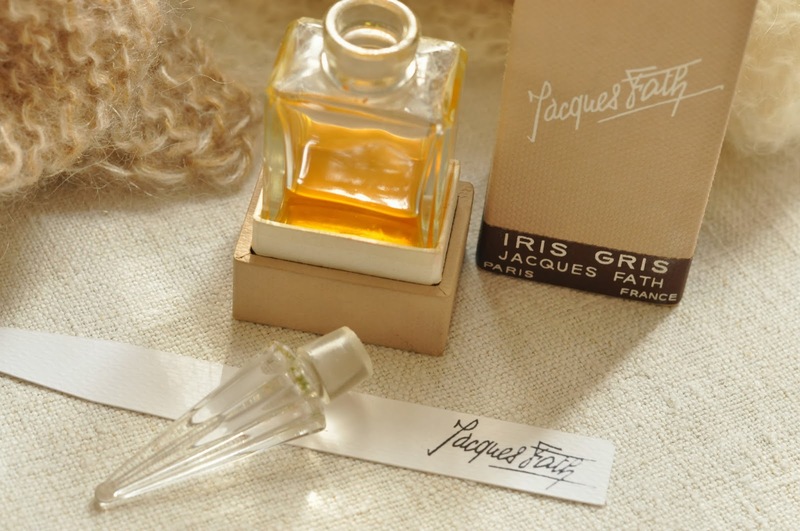 You know by the title which masterpiece of perfume history I am referring to, the incredible and so ridiculously hard to find, Iris Gris de Fath. This perfume is one of legend among connoisseurs; the proverbial ‘white whale’ among iris / orris perfume lovers in the know. Any vintage perfume collector can tell you how hard this fragrance is to come by and if you do, how expensive just a sample or decant can be. I have seen mini *eau de tolette* bottles go on ebay for upwards of $300. For less than 10 ml, that’s a serious investment. I happened to get very lucky when I found a partial bottle of the pure perfume for less than an arm and a leg. It’s one of my “preciouses” that I found for my little perfume museum and it is perfect. This commission, too, was really perfect for me in so many ways. First of all, I love the behind the scenes work of developing my sense of history and working at becoming a perfume historian. It gets right to heart of my geeky / hermit streak. You know, I adore the thought of being hold up on a desert island with my museum pieces, notebooks and my computer to just spend countless hours exploring the ins and outs of what’s happening in these precious bottles of living history; what they meant and mean to us now, as well as their construction, materials (many now long gone from the market and use) and the artists intent behind them. It’s like having conversations with Picasso, Shakespeare, Michelangelo… finding the avenues to their greatness on a trail of crumbs left behind. It’s pure bliss and I can’t express how much joy these objects contain for me. But I digress (as I often do). Can I just say, Iris Gris is magnificent. Truly. It’s subtle and bold at the same time; elegant and cool but beneath that haute couture outfit lurks a real, sensuously warm-blooded being. I love that it feels so timeless as well. Yes, there is a vintage feel in that ‘they just don’t make ’em like they used to’ vibe but it’s so flawlessly constructed that I believe we would love to smell like this today (and every day). You may be wondering how I go about deconstructing a perfume in order to create an original formula based on my research and smelling it on my ‘subject’. Well, it’s just that: smelling. I don’t use a GC or any kind of computer to detect the chemistry. I have always felt that the key to getting reproductions right is in the smelling and the human experience that’s in the feel of the perfume, not just its smell. Another key is to attempt to get into the head of the ‘lover’ (the person who is commissioning the perfume) to understand what they are smelling, experiencing and taking note of. Everyone smells in a unique way, so what is important in a fragrance or aroma signature to you may not be the points of importance for someone else. The trick is to get into another person’s heart and mind to find those sweet spots and be sure to hit them in the new design. Not an easy task, but very worthwhile. You will learn A LOT about people and fragrances…and so I have. 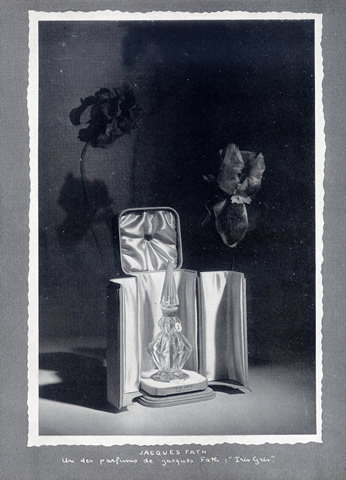 image credits: photo image by jennie marie schell found here; iris gris drawing found here; iris gris perfume bottle image found here; iris gris perfume ad no.1 image found here. How exciting! 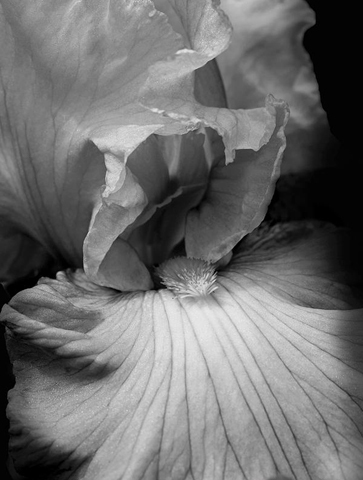 I’ve been craving a cool, rooty iris perfume recently, and yours sounds like it will be exquisite. When will it be available for purchase online? And having never smelled Iris Gris, I’m curious about it. Can you compare its scent to Heeley Iris de Nuit, perhaps? I’m familiar with IdN. Hi, LB~ Thank you for commenting! 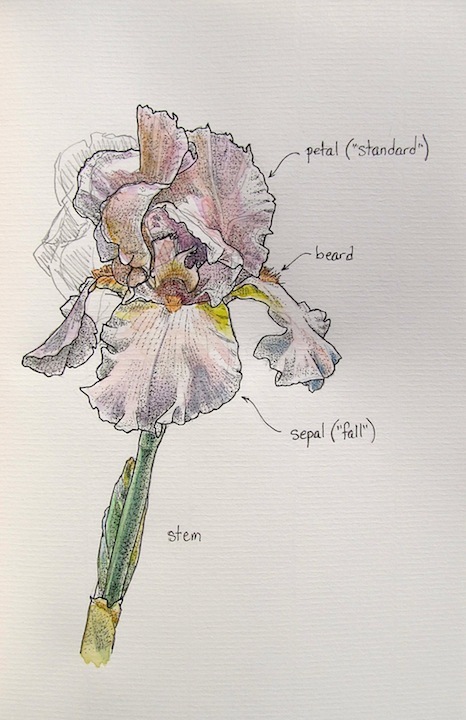 🙂 Iris Gris is less rooty and woody than I suspect the Iris de Nuit is… I smelled IdN a long while ago and as I recall, the woody aspect of both the iris and the violet is more highlighted. The peach aldehyde does wonders for the ionones (violets) and also integrates the orris butter / orris absolute into something very soft but present… And as this is a vintage (and French) design, there’s more animalic happening at the very end of the perfume than I would expect any modern construction is going to have. There is a definite civet end to this that may or may not meet with every modern Iris lovers approval. It’s not that it goes to deep civet like Jicky but it’s there, along with a musk and ambrette at the very end. I’m not sure if that helps… but you will get the chance to smell it if you wish as we are planning to release it some time soon with the hope to partner with some cancer organization to donate a percentage of the sales to. Believe it or not finding a partner (recipient) is the hard part. But stay tuned… I will be sure to let everyone know when the release will be. I also wanted to add that you’re doing a lovely thing for your client. There’s nothing like a beloved scent to bring comfort and happiness. You are so right about the power of a beloved fragrance. And thank you! She is over the moon in love with what I made for her which is a rich reward for me as well. Thank you so, so much, Queen Cupcake! I will pass on your lovely, healing thoughts and prayers and I think that you will love hearing more about this fabulous story. I can say that my client is very much in love with what we made… the new design smells just like the original with the exception that the original smells over 60 years old and the new one smells, well, new. That’s it. It really is true blue on her skin; a match. And you can see the feeling of relaxation and deep pleasure wash over her when she puts it on and smells herself. It makes me SO VERY happy to see this, I can’t describe how much. when will this be released for moi?